Grand Prize X 2 : 2 rooms at Sayang-Sayang Youth Hostel Riverside for 4 Persons 2 days 1 night and 4 adult tickets. 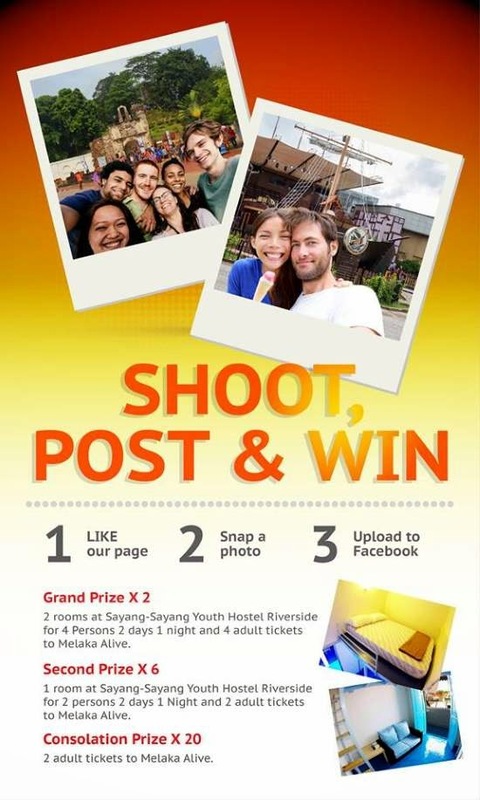 Second Prize X 6 : 1 room at Sayang-Sayang Youth Hostel Riverside for 2 persons 2 days 1 Night and 2 adult tickets. Consolation Prize X 20 : 2 adult tickets. Then upload photo at Official Melaka Alive page. Share the photo and get many likes as you can from your friends. Visit Melaka Alive Facebook Photo contest page for more details.